Please click on the link above to register and attend a free webinar demonstrating Odyssey eFileIL. Attorneys may enter their Illinois ARDC number for 1.0 hour of MCLE credit. The webinar is offered at different dates and times. 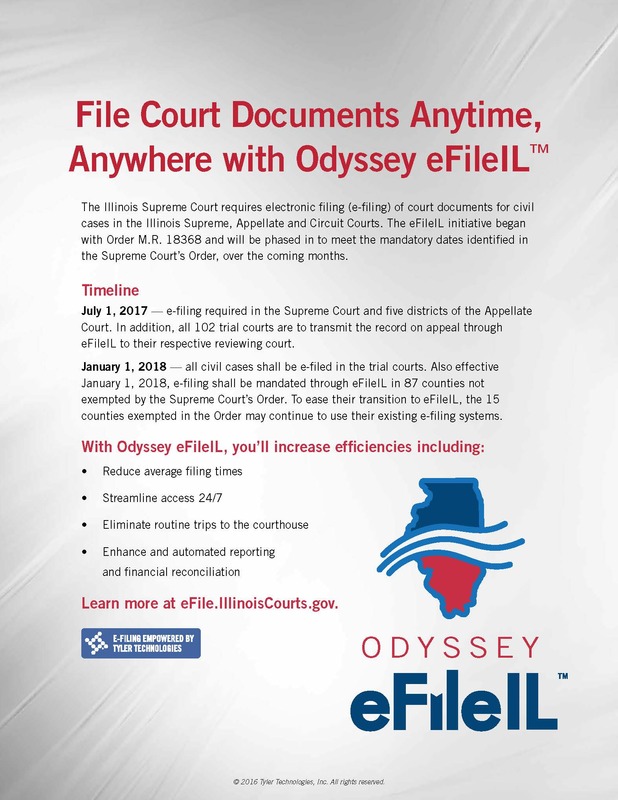 Effective July 1, 2015 The Office of the Clerk of the Circuit Court of Will County will notify attorneys and pro se litigants VIA E-MAIL ONLY if there is a scheduling conflict in any case before Judge Powers. This policy only applies if the scheduling conflict is discovered within two days of a scheduled court date. All other correspondence will continue to be sent from the Circuit Clerk’s office via U.S. Mail.The Circuit Clerk’s office will use e-mail addresses provided by attorneys for their iAttorneyTM accounts (IL12thiAttorney.org) or by pro se litigants on their initial filing or Answer. The Circuit Clerk’s office will no longer be contacting attorneys or litigants via telephone (e-Notification Poster). Do I need a cover sheet for new case filings? No cover sheet is required. Do I need a Will County I.D. number for filings? No, Will County does not assign I.D. numbers. Please use your ARDC number on all filings. Can I obtain a court date over the telephone? No. You may check a judge's availability using the Availabilty Calendar on our website. Indicate the date and time you choose on your Notice and Motion where appropriate. How do I find a list of mediators and GALs? Click to find a lists of Mediators , Probate GALs and Family Division GALs. Click below to register or login to iAttorneyTM. Please Note: i2File is a 3rd party vendor, not affliated with the Will County Circuit Clerk's Office.